Matt and Juliet gave everyone a craft beer or wine or gourmet coffee or milk, along with the promise to make a meal pairing the beverage. Such an inspired, ideal gift. For me they chose bottle #154 of Horse Feathers Rye. This strong rye ale is brewed by Upstream Brewing Company in Omaha and aged in former Templeton Rye barrels. 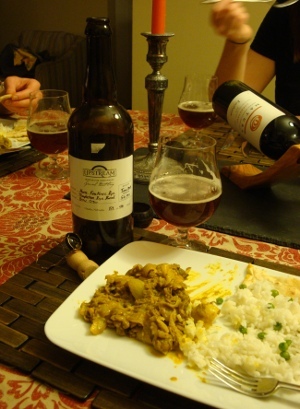 To pair with this spicy beer they appropriately made a spicy Indian lentil dish and fresh naan. The Horse Feathers Rye is quite hazy, a ruby tinted hazelnut brown with a creamy, off-white head. The aroma is strong with ginger, to the point where you could confuse it for ginger ale. But there is plenty of rye spiciness and Templeton sweetness to it as well. There is also some caramel, and plenty of vanilla from the oak. The flavor is a remarkable balance between the competing forces of the rye, rye whiskey, and ginger. The malt adds a significant presence, so there is an overall sensation of licorice, caramel, and even cola. Lingering spice and sweetness are light enough to reveal a hint of the alcohol. The body is light and active, but full and rich. Brewing a beer with the strong flavors from either rye or barrel-aging is an exercise in delicate balance, but both together, not to mention the heavy ginger addition, takes the challenge to a whole new level. Upstream delivers admirably.